Electrospinning is a simple and highly versatile method for generating ultrathin fibres with diameters ranging from a few micrometres to tens of nanometres. Although most commonly associated with textile manufacturing, recent research has proved that the electrospinning technology can be used to create organ components and repair damaged tissues. 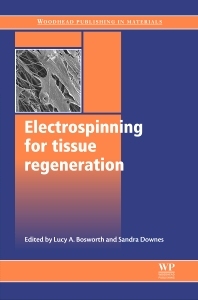 Electrospinning for tissue regeneration provides a comprehensive overview of this innovative approach to tissue repair and regeneration and examines how it is being employed within the biomaterials sector. The book opens with an introduction to the fundamentals of electrospinning. Chapters go on to discuss polymer chemistry, the electrospinning process, conditions, control and regulatory issues. Part two focuses specifically on electrospinning for tissue regeneration and investigates its uses in bone, cartilage, muscle, tendon, nerve, heart valve, bladder, tracheal, dental and skin tissue regeneration before concluding with a chapter on wound dressings. Part three explores electrospinning for in vitro applications. Chapters discuss cell culture systems for kidney, pancreatic and stem cell research. With its distinguished editors and international team of expert contributors, Electrospinning for tissue regeneration is a valuable reference tool for those in academia and industry concerned with research and development in the field of tissue repair and regeneration. Those in academia and industry concerned with research and development in the field of tissue repair and regeneration. Dr. Lucy A. Bosworth and Professor Sandra Downes both work in the Materials Science Centre at The University of Manchester, UK and are widely renowned for their research into biomaterials, tissue engineering and electrospinning.